For the past few years I have had the pleasure of getting to know the Yukon, making at least one trip up every summer. This year was going to be particularly interesting though, as we (Logan and I) would be heading way out into the wilderness, miles from anything. 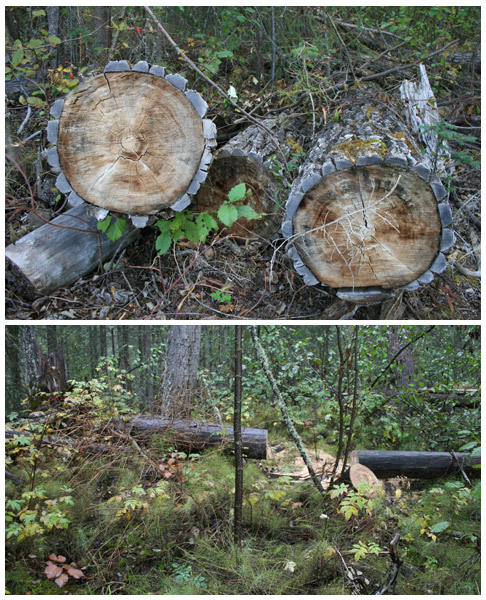 Although we had planned this excursion for a leisurely visit to a family cabin, there was work to be done as well. 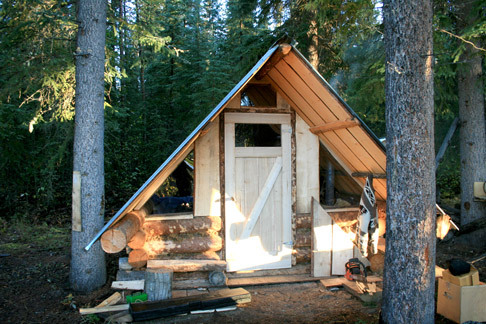 If you have ever been up north in the Yukon, you have very likely seen an old wood cabin or two – built with criss-crossed logs stacked up high, a peaked roof and moss fitted into the gaps to insulate against the harsh cold weather. Well, interestingly enough, House of Doors owner, Logan Gilday grew up in the Yukon, and he’s seen plenty of wood cabins. (Perhaps this is where is love of wood buildings began…). 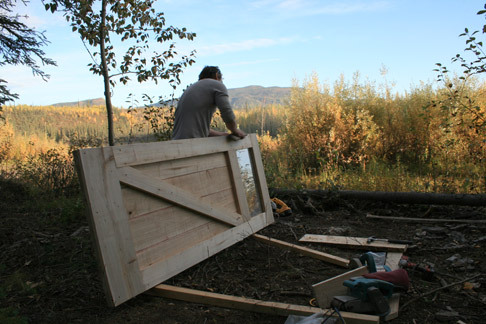 It’s been a little while since Logan has done any building in the Yukon, but during this trip on the Stewart River he had the rare and wonderful opportunity to build a wood door for a little summer cabin - in true northern style. Way up the river, and far out of reach of any resources, the nearest grocery store, town or neighbour for that matter, is over 150 kilometers away. What we brought with us on this trip was minimal, but we made our choices wisely. Already there at this little family cabin were some tools, a small generator, and a second cabin that just happened to need a door in order to make it complete. Doors in B.C. 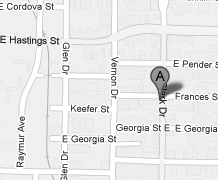 are commonly built from Fir trees because of their abundance to the area. In the same way that we use our resources there, Logan looked to the natural and available resources around him. Though many of the trees that grow in the Yukon are stunted because of the cold and the short growing season, in this region in particular there is plenty of large and healthy Spruce, as well as some Cottonwood. There just so happen to be a fallen cottonwood log nearby; one that had lost its bark long ago and was dry enough to work with. Excited at the prospect to build a wood door in the wilderness, Logan got busy at work. 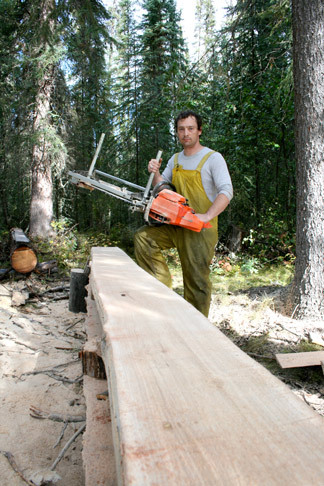 The prep work on a chainsaw mill is easily what takes the most amount of time, and getting a straight first cut is important. 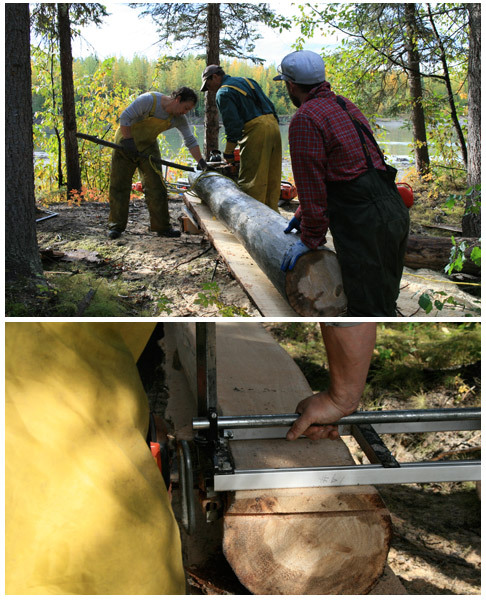 There is no sawmill facility out here, but there is a level, marking tape, and a couple of extra hands around to help with the lifting. After the first cut, the log has a level surface and the next few cuts come along relatively smooth. When the entire log is milled, there are five lengths of cottonwood stock, each with beautiful soft ashy-coloured surfaces which are faced with gently winding grains. The next step is to decide what style of door to build, and seeing as panel work is particularly difficult without a router, it’s decided that this will be a traditional plank-style door (very fitting for a northern cabin!). The rough opening gets measured up, a few cuts are made, and before you know it, the components are all ready. Putting it all together is no easy feat either, but with Logan’s background in construction and design, he makes it look like a piece of cake. As there happened to be a small piece of Lexan (heavy plexi-glass material) left over from the cabin construction, he managed to work in a nice window “lite” for the top of the door too – great for letting more light into the cabin. A bit of time goes by, and Logan diligently measures and trues all the angles, making sure the door is going to fit perfectly into its new home. Some light sanding gives the door a smooth finish, and once the Lexan goes in, some “home-made edge molding” goes over top to keep it in place, and voilà! A door is built! Not every line is quite perfect, nor every angle quite true, but what make this door so special is the story behind building it. 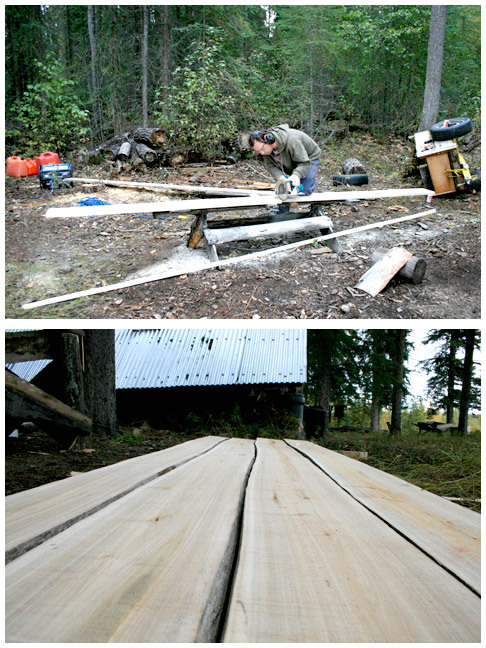 Luckily, doors can be built with (much) greater ease back home in BC, but one thing remains the same; a wood door starts as a tree that grew from the earth, and is put together by hand, making each and every one unique. Great story…and I loved the pictures. The door turned out really well. Nice job! Well told Danielle, and good pictures too…….